Fallkniven is a true family firm, with roots deep in the soil of Norrbotten, Sweden. The firm started operations in 1984 and today is acknowledged as one of Sweden’s foremost knife specialists. Through broad experience, testing and research, Fallkniven now makes the world’s leading specialized knives. Because of this, today they are the purveyor to His Majesty the King of Sweden. 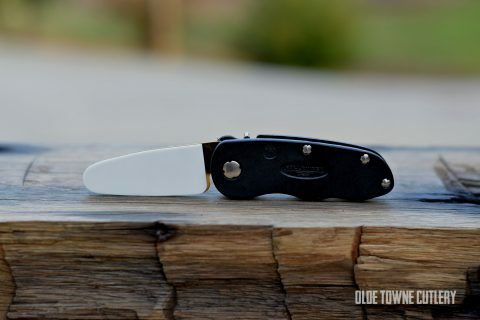 If this is a brand unfamiliar to you, let us at Olde Towne Cutlery assure you that a Fallkniven knife is a superb tool with amazing fit and finish. FallKniven FlipStone, Diamond Ceramic, Diamond grit – 25 micron, Tan plated, Ceramic grit – 1 micron. Laminate Cobalt Steel, Cocobolo handle, Stainless bolsters, lanyard slot, inlay shield, nail nick, Blade length 3″, Handle length 4″, OAL 7″. 3G Steel, Cocobolo handle, Stainless bolster, Black Cordura sheath, Blade length 2 3/4″, Handle length 3 3/4″, OAL 6 1/2″. 3G Steel, Cocobolo handle, Black Cordura sheath, Blade length 2 1/2″, Handle length 3 1/4″, OAL 5 3/4″. Fallkniven makes a superior line of products. P Linerlock, 3G Steel, Cocobolo handle, thumb stud, Black Cordura sheath, 3″blade, 4″ handle, OAL 7″. Green Micarta handle, Stainless bolster, lanyard slot, stainless pocket clip, thumb stud, Blade length 3 1/2″, Handle length 4 1/4″, OAL 7 3/4″. Maroon Micarta handle, Stainless bolster, lanyard slot, stainless pocket clip, thumb stud, Blade length 3 1/2″, Handle length 4 1/4″, OAL 7 3/4″. Fallkniven knives are of superb quality. Folding Hunter, 3G Steel, Maroon Micarta handle, Stainless bolsters, lanyard slot, stainless pocket clip, nail nick, Blade length 2 3/4″, Handle length 3 1/2″, OAL 6 1/4″. Fallkniven makes an outstanding product. Gentleman’s Linerlock Folder, Laminate Cobalt Steel, Green Micarta handle, Stainless bolsters, lanyard slot, inlay shield, nail nick, Blade length 3″, Handle length 4″, OAL 7″.